BANGI, 26 June 2012 – A Panel of experts should be set up to undertake indepth studies of traditional Malay healing practices to prevent the knowledge from being forgotten into oblivion. An expert researcher on Malay literature and traditional Malay culture, Dr Harun Mat Piah said the panel should consist of doctors, traditional healers, botanists and herbalists as well as classical Malay linguists. 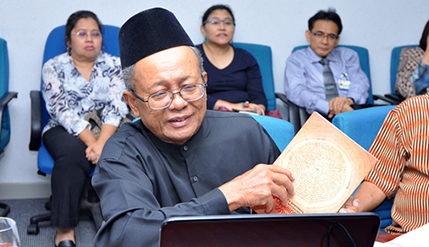 Dr Harun made the suggestion in his discourse on Traditional Malay Healing Practices from Old Literatures at the Institute of the Malay World and Civilization (ATMA), UKM this morning. He said traditional Malay medicine is a treasure trove of knowledge and heritage which needed to be studied for posterity to benefit the people now and in the future suggesting the Ministry of Science, Technology and Innovation (MOSTI) provide a grant for the study. Dr Harun, a former lecturer with UKM said numerous volumes of manuscripts and other Malay works were kept all over the World. The Malay Manuscript Centre at the National Library also keeps about 40 volumes of such works categorised as “Kitab Tib”. The name is from the great work authored by the 10th century doctor Abu Ali Al-Hussain Ibn Abdallah Ibn Sina (Avicenna) whose manuscript Al-Qanun al-Tibb, or the Canon of Medicine formed the basis of modern medicine. He said Kitab Tib is filled with secrets of traditional Malay healing practices which showed the wisdom of past generations. Before the advent of modern medicine, healing and apothecary consists of items found in nature mainly herbs and ingredients from animals and the earth. Some of the knowledge were written down but a lot of others were memorised and passed down by word of mouth through the generations. Others were mentioned in old Malay epics and folk lores. The Kitab Tib, he said, was more than a treatise on medicine as it was also a source of knowledge on magic spells, charms, incantations and aphrodisiacs in addition to instructions on how to predict the future as well as astrology. Other mundane subjects like agriculture, languages and carpentry were also covered in addition to advice on how to exorcise demons and jinns from the sick and the obligatory magic spells and talisman. The Kitab Tib also detailed the types of ailments and their remedies, the medicines, the ingredients of potions and abstinence and abstentions of patients. Methods of prevention of diseases were also included as was herbal therapy and their links to good nutrition and general wellness. Dr Harun was confident that the present generation could learn from the Kitab Tib which was a collection of wisdoms culled by traditional healers from over hundreds of years. He believes that 70% of the source on medicine came from the Islamic World, from the Arab, Persian and Central Asian physicians and information on magic and charms were from the Pre-Islam Malays at the time when they were animists as well as Hindus and Buddhists. Other sources include Portuguese, Dutch and English remedies. Dr Harun finds the language used in the manuscripts are rather archaic and cannot be understood by modern bahasa Malaysia speakers. He said it takes a Classical Malay scholar to decipher the text as some expressions used have changed meaning today while the weights and measures used such as tahil, cupak and gantang were no longer in use. He estimates that most of the manuscripts were written from the 1820s till early 1900s. Dr Harun recieved his bachelor’s degree at Universiti Malaya (UM) before going to The School of African and Asian Studies (SOAS) at the University of London. He later taught at UKM. 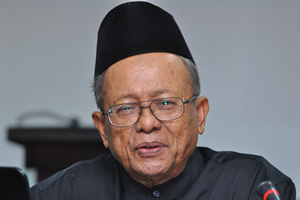 A renowned researcher of Malay Literature and Culture, he was born in Kuala Kangsar, Perak. 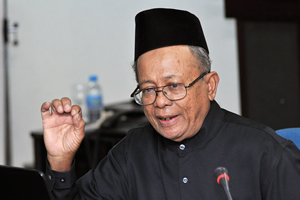 He obtained his PhD in Classical Malay Literature and has served at the Education Ministry before teaching at UKM, the University of Michigan and the Brunei Darussalam University. Dr Harun also studies and writes about his findings from various Malay literary works kept in various collections around the World. His publications are about the great malay epics or Hikayat, traditional Malay poetry and writers. He has also been a guest scholar at the national library in 2002 where he worked on the Kitab Tib.